Mushrooms are a common problem for homeowners struggling to keep their lawns in top shape. Often stemming from decomposing material in your lawn, mushrooms can grow and spread quickly across the grass. One solution is to this problem is vinegar, a household item that works as a natural fungicide. With proper application, the acetic acid within the vinegar will kill the mushrooms and hinder their return. 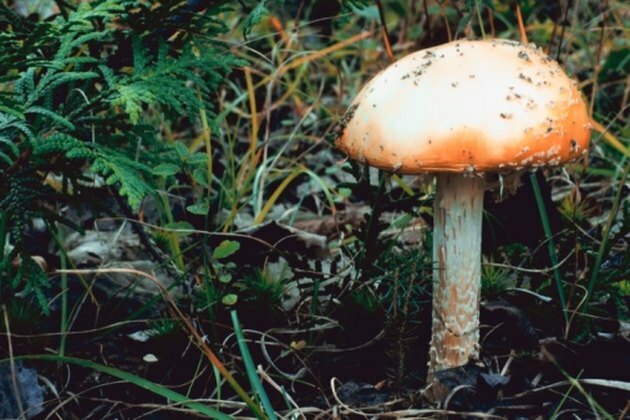 Kill unsightly mushrooms in your lawn with a vinegar solution. Dilute white vinegar by incorporating four parts water to one part white vinegar in a plastic bucket. Use a funnel to pour the diluted vinegar into a spray bottle. Protect your hands with pair of work gloves and cover your eyes with goggles. The goggles will be helpful in the case that the wind blows the vinegar toward your face during application. Spray the mushrooms on a day that is above 60 degrees Fahrenheit, yet below 85 degrees. Days with little wind will help you to target the mushrooms in the lawn easier. Hold the tip of the spray bottle 4 to 6 inches away from the mushrooms and cover them with a heavy dose of the diluted vinegar. Avoid spraying the vinegar solution onto the surrounding grass, which also will be killed. Wait three to four days for the vinegar to kill the mushrooms and then monitor the lawn for lingering growth. Spray remaining mushrooms and monitor them until they have died. Rake up the dead mushrooms to remove them.